For the last couple of weeks I've been using a couple new items when it comes to post-shaving the pubic area. It's one area that I'm forever having to work on, it's neck breaking and a cirque du soleil act, besides the rules we already know, such as use a brand new razor, the more blades the better (I tend to lean towards men razors for that), unscented shaving foam to eliminate irritation there's a few other things that can be done. Scouring the internet I found a hair softener, if you ever find the hair when it grows back is a little coarse which prevents you from shaving as quickly as you'd like. Using the Soften Her exfoliating disc daily really does help to keep the hair soft and I've had less growth irritation and ingrown hairs since I've started to use it. The discs are hypoallergenic, reusable and disposable. I'm still using the first pad (you get 3 in a pack) it's still got a good amount of use in it. Reminds me of a more gentle grade sandpaper, yeah sounds crazy but it works. Used once a day, be gentle with it and use it in counter clockwise and clockwise motions and continue to move it along the skin don't use it on the same spot for too long. ETA : The Soften Her discs can be used on your arms and legs also. 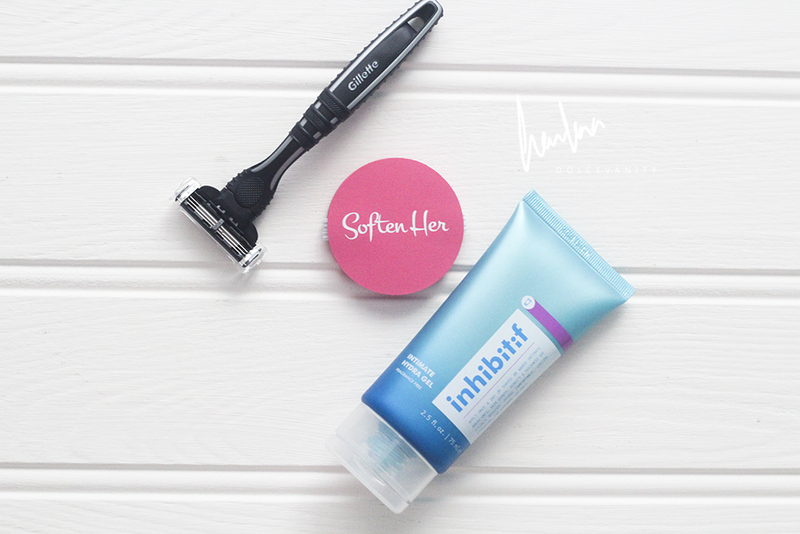 The Inhibitif Hair-Free Intimate Care* is a gel that helps the appearance of hair to slowly grow back. You only need a small amount of the intimate area of your bikini area and allow to dry before putting on your clothes. You only need to use it once a day so whenever you feel comfortable. I tend to do it nightly as that's when them pesky hairs decide to want to grow quickly like I didn't spend an hour removing it. Within 8 weeks you should see a difference, within a couple weeks or so I've already started to notice that it's possibly working for me. Let's see afterward the couple of months or more so when the tube is finished. Have you tried either product? The hair softener sounds interesting! Haven't heard of anything like it before.